Here is the ‘behind the scenes’ story of how the Lion attacks Giraffe video came about. If you haven’t watched it yet, you can view it below. Please note it’s not for sensitive viewers. It was just another day at the office for Ranger Jone’ who was on an evening game drive at Shamwari Game Reserve with her guests. 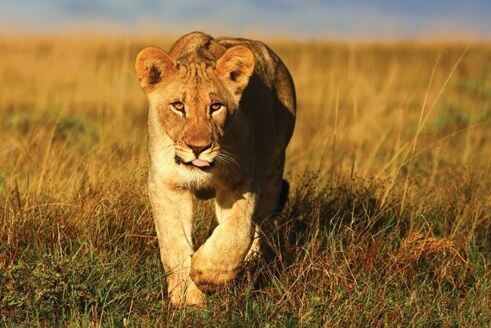 While driving along she received a call on the radio about the presence of lions in the area. Making their way there they came across two burly lionesses hiding behind a wall of bushes. “We looked around for what they could be approaching and there, a few meters away, we saw a mother giraffe and her year old calf.” says Ranger Jone’, the videographer that day. The action was slow in coming. While the guests readjusted their heart rates, they patiently sat and watched the lionesses for several minutes, anticipating what they might do next. After a while the eldest lioness saw a gap and stalked slowly to a bush near the giraffes. Blissfully unaware, the giraffes continued eating. “Her execution was flawless. It was that impressive leap onto the youngster’s raised thigh that sealed the deal. It was an absolutely unforgettable thing to see and it confirmed that this Grandma still had some oomph left in her!” says Jone.